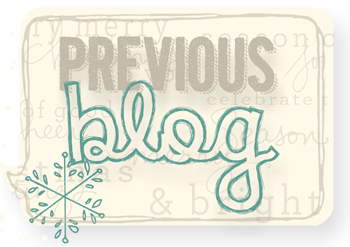 If you are following along in order, you just came from Holly Krautkremer's blog. Wow, right! 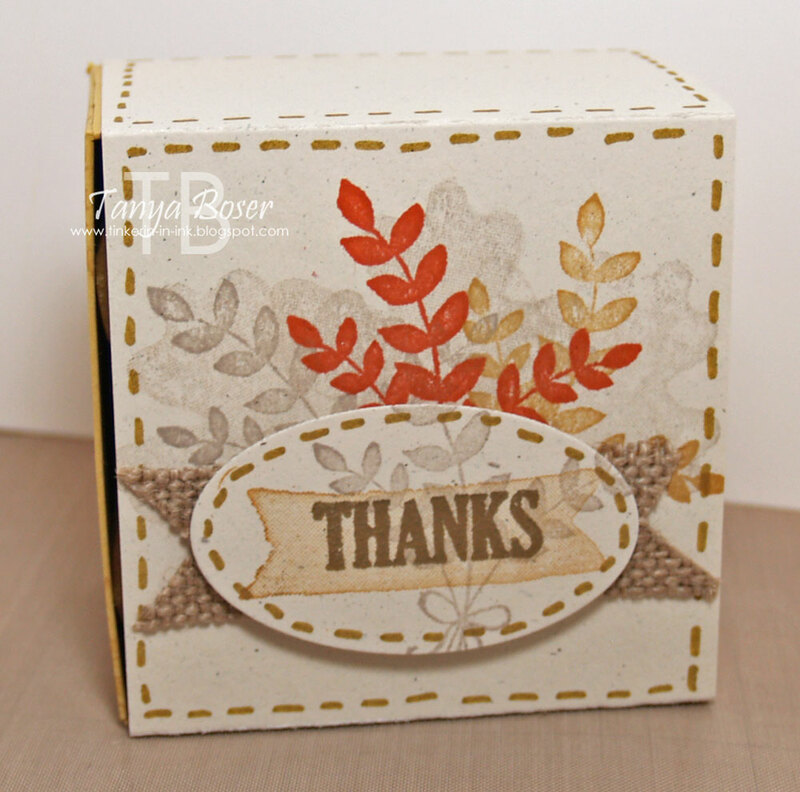 There was sponging and water spritzing, heat tooling, and water dropping involved along with stamping and heat embossing right over the watercolor effect. One of my favorite inks to use with watercoloring is the Pear Pizzazz ink. It bleeds out into so many shades of green and brown and has this incredible earthy feel to it. 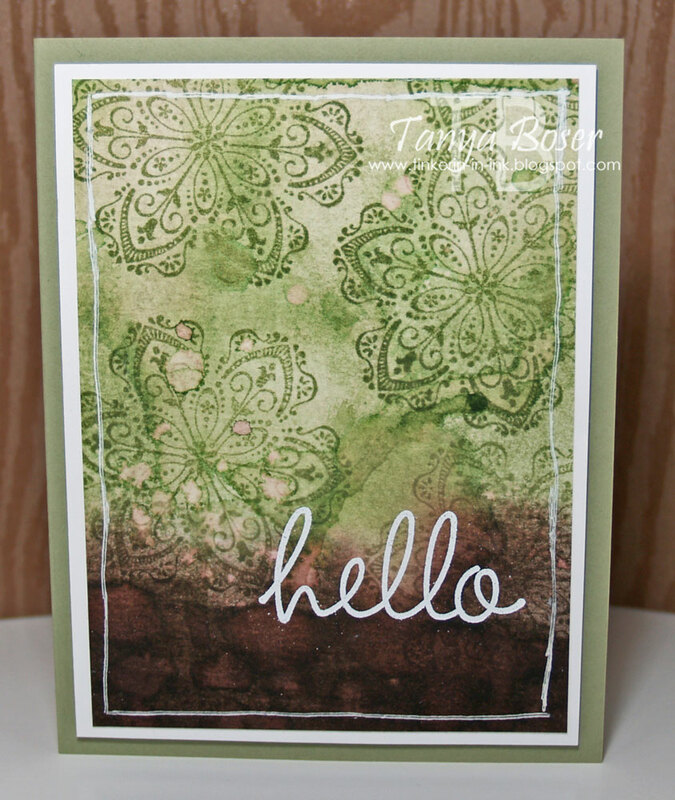 The flowers were stamped right over the dried watercoloring in Pear Pizzazz ink. 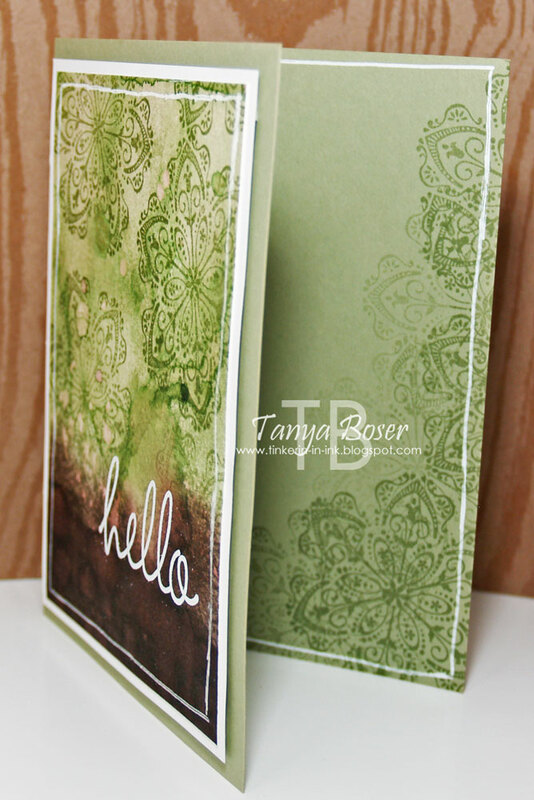 Then heat set one more time and wiped really well with the Embossing buddy, and wet embossed the "hello". 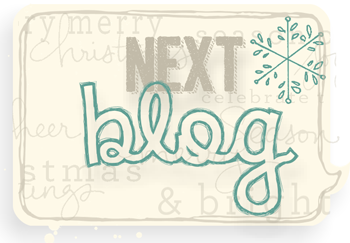 Ok, now off to Beth Beard's blog. I know she will have something fabulous waiting for you! Yeah for another hop with the Stamp Review Crew! 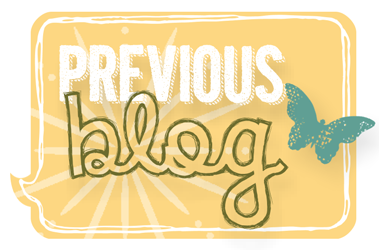 This is a very special hop for us as we started this adventure one year ago! And coincidentally, we featured a snowy set that time too :) I hope that you have found that we are getting even better with time. 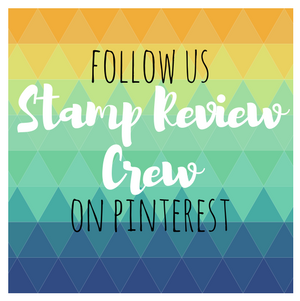 If this is your very first visit, we are a group of Stampin' Up! 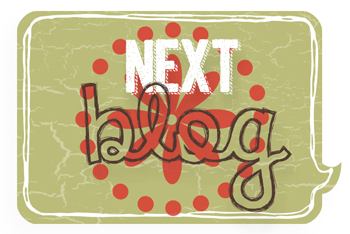 demonstrators that do a blog hop on the first and third Mondays of each month. Each hop features a different, and single, stamp set to give you fresh ideas and to show you just how much you can do with them. If I am your first stop, have no fear, you will not miss a thing as the hop goes full circle. If you get lost along the way, just click on the banner at the top to go to the official hop post and you will find links to all of the participants in this hop. 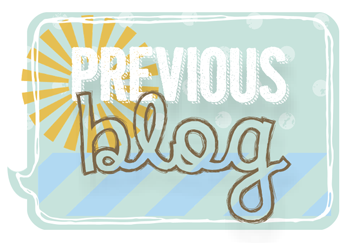 If you are following along in order, then you just arrived from Yapha Masons's blog, fantastic, right?! Now, on to my projects. 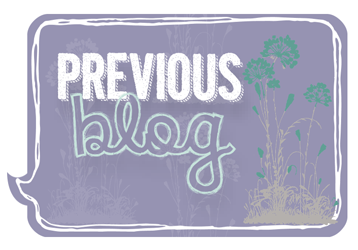 And I will be the first to admit that I went a little crazy making stuff for this hop. Some people have a thing flowers or butterflies, or llamas ;) Snowflakes are always a favorite of mine. I can't seem to pass up a snowflake set (or a leaf set for that matter, but that is another story, lol) to save my life. I don't get rid of them either! So of course I snapped this set up as soon as it came out last year. The rhinestones are colored with Blendas. The shiny dots are Smooch Pearlized Accent Ink in Moonlight and Silver Fox. SU used to carry it and I have 2 bottles of each color we carried because I love it so much.You can still get it in a variety of online places. Here is a little peel inside. I did try to keep this card pretty flat for mailing. For this card, I took some watercolor paper and sponged it heavily with Night of Navy and Bermuda Bay, then spritzed with water to blend them a bit and create lighter speckles. This creates a wonderful night sky background. 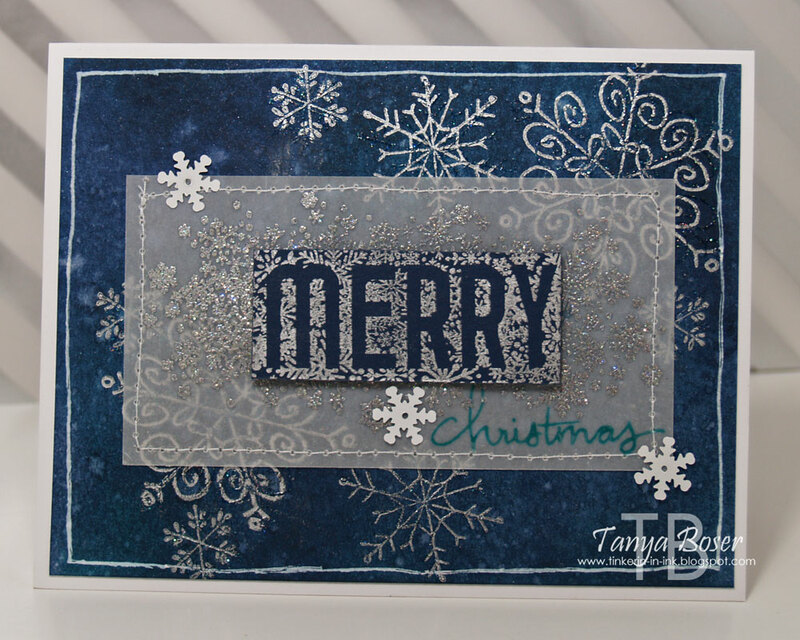 I dried it with my heat tool, and then stamped snowflakes in Versamark and embossed with Iridescent Ice. They did not show up as well as I had hoped they would, so I stamped them again with Silver Encore ink. Now that really popped! And with the Iridescent Ice shadows, wow! The vellum was stamped in Versamark, embossed once with Silver embossing powder, then sprinkled again while still hot with Iridescent Ice and heat set again. Gorgeous effect in real life. 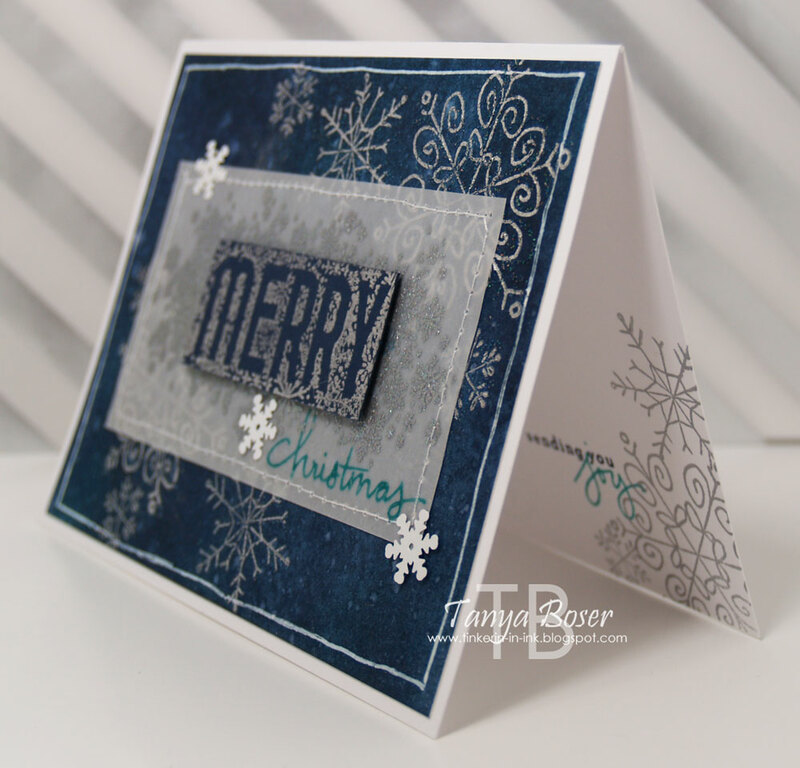 "Merry" was stamped in Silver Encore ink on Night of Navy paper, then trimmed to fit. Some silver snowflakes, and a sentiment in Night of Navy and Bermuda Bay on the inside finish this off nicely. This time, I utilized one of the perks of using photopolymer stamps. 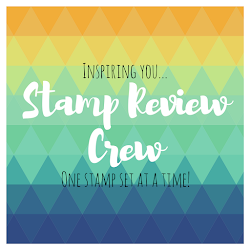 Flipping the stamp over and stamping a solid shape of the image as a background for it! How awesome is that?! The inside was treated with a pile of colorful snow also. 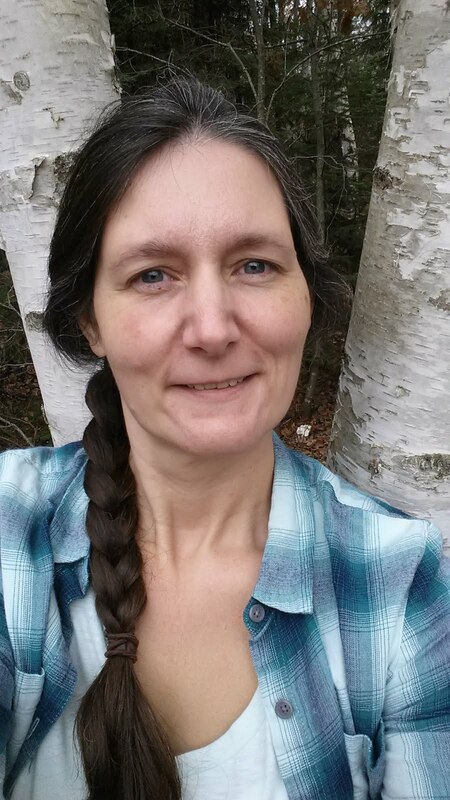 That is all for me, now it is time to go see what Debra Burgin has in store for us! This card started sometime in September when I made about 6 different panels with watercolor paper and different watercolor techniques. I went a little wild with it. I am still quite enamored with this whole watercolor thing :) Beware! Then the panels all sat there for a while, as I admired their beauty and did not have the heart to cut them up or cover any of it up. Silly, I know. In late October, I finally decided I have savored these panels long enough and started making some cards with them. I cut this panel in half and made 2 cards that are almost identical. 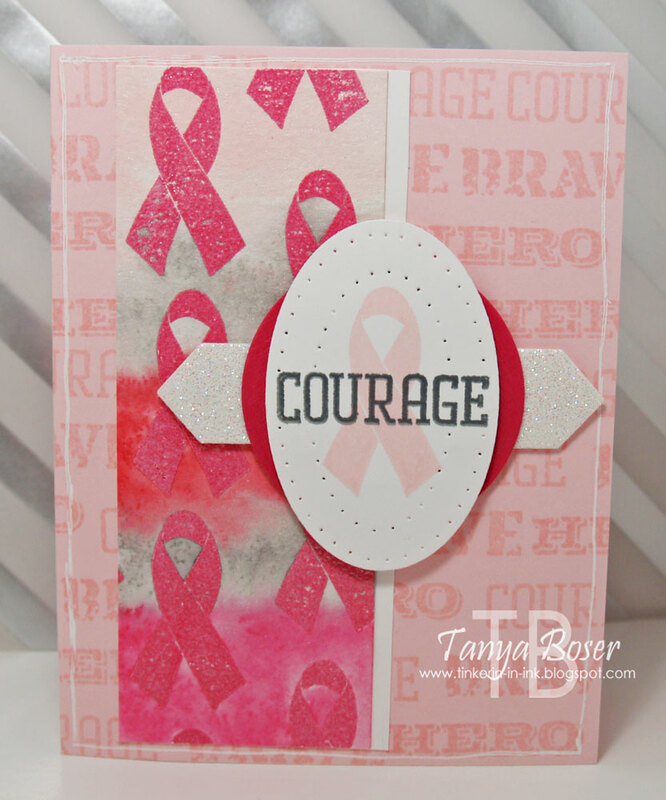 To create the panel, I first embossed the ribbon in Melon Mambo embossing powder all over. Then I sponged stripes of color onto the panel, alternating shades of pink (Pink Pirouette, Strawberry Slush, and Melon Mambo) with Smoky Slate. Then I took a mixture of water and Pearl colored Perfect Pearls and spritzed the whole panel, and dried it with the heat tool. Fantastic shimmer results! 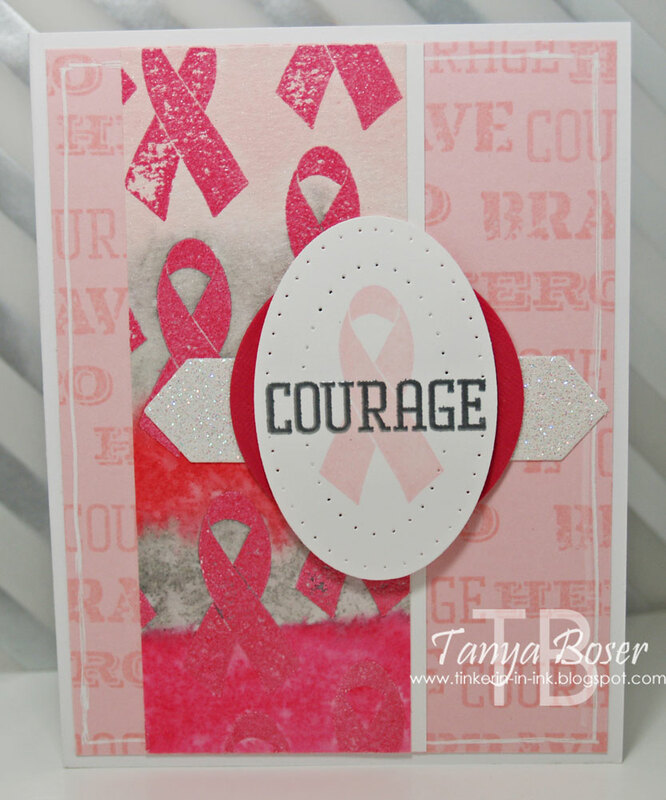 The ribbon was stamped with Pink Pirouette, then Courage was embossed in Silver embossing powder. Diecut and paper pierce the oval, diecut a 2¼" circle, and one of the banners from the Project Life framelits set in Dazzling Diamonds Glimmer paper. 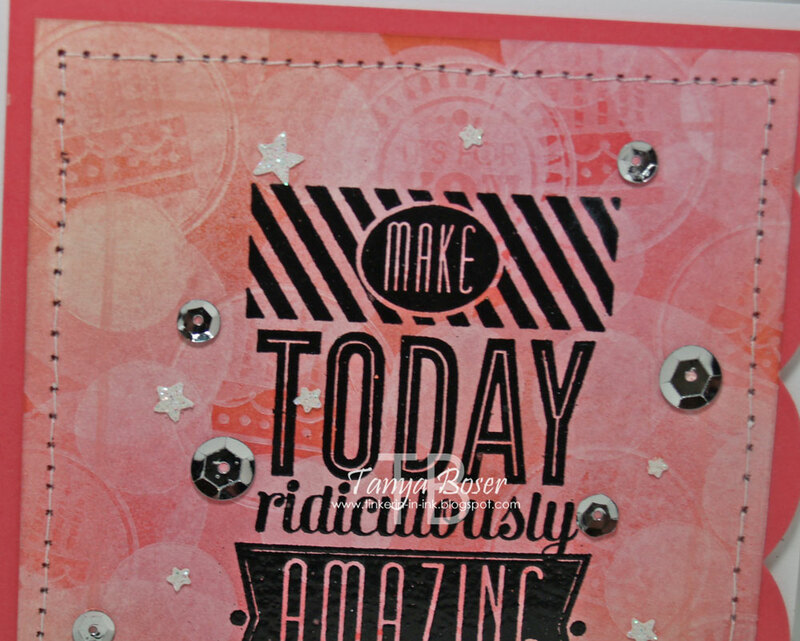 I stamped all over the Pink Pirouette panel with the words in Pink Pirouette. 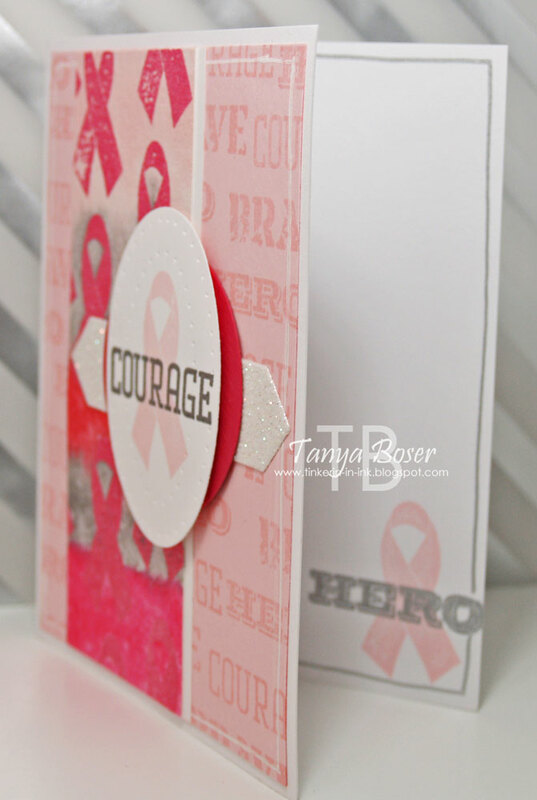 Inside, the ribbon is stamped in Pink Pirouette and then Hero is stamped in Silver Encore. I outline the inside panel with the white gel pen. Then I decided to put the second one on a white card base. I think I like this one better. This one got outlined with the Silver Dazzle marker on the inside. I discovered that the 2 retired sets that I used are actually available as MDS digital downloads too! SO, after doing only 2 videos in the career of my blog, I am trying again :) I have to say, this was the easiest one so far, despite the fact that I had an absolutely ridiculous set-up involving my cell phone, a goose neck lamp, a piece of MDF, and Painter's Tape, lol! Score at ¾", 2¾", 5¾", 7¾"
Score at 3-1/16", 5-1/8", 8-3/16", 10-1/4"
Score at 3-1/8", 5-1/4", 8-3/8", and 10-1/2"
I went ahead and made up some more boxes with all the materials I used in the video. Waste not, want not you know! You see the tops of all three in the banner at the top of this post, here are the sides of all of the boxes. I only stamped on the 2 sides that show when the slider sleeve is in place. Sometimes before I assemble boxes, I stamp a message in the bottom, but not this time. I did manage to stamp these on the assembled box. It was a bit of a challenge, but that just makes life interesting, right! This one is very simple. The most challenging thing was fussy cutting the banner. I love how the Gold Encore ink looks on the Hello Honey banners. There is some 2nd and 3rd generation stamping here too. 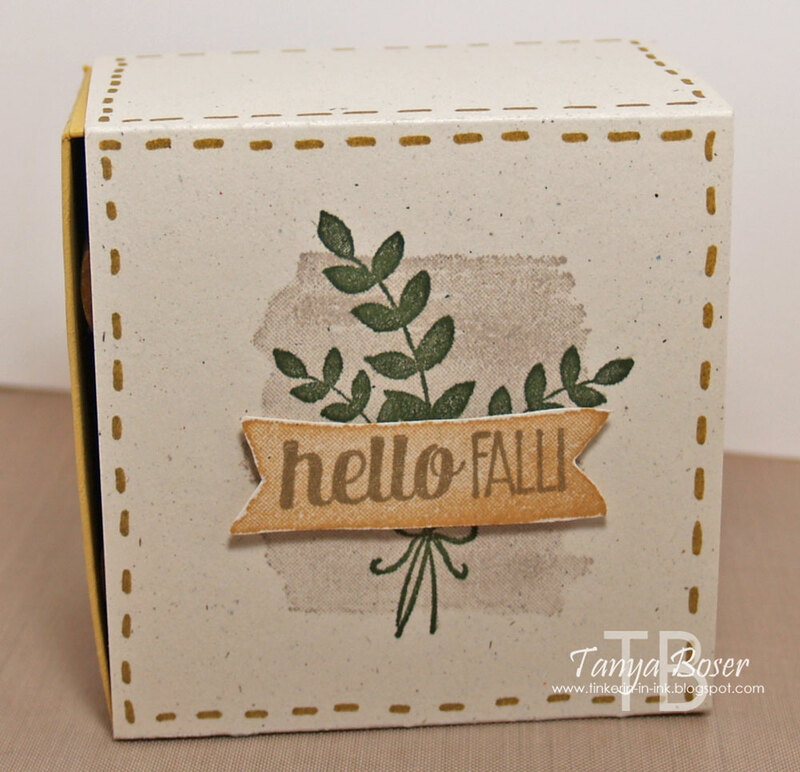 Just some simple stamping on the side of this one. OK, now on to my projects! Let's start with this slightly different take on the oh-so-popular right now technique, Bokeh! I do really love the Bokeh effect and there are lots of videos out there on how to achieve it. 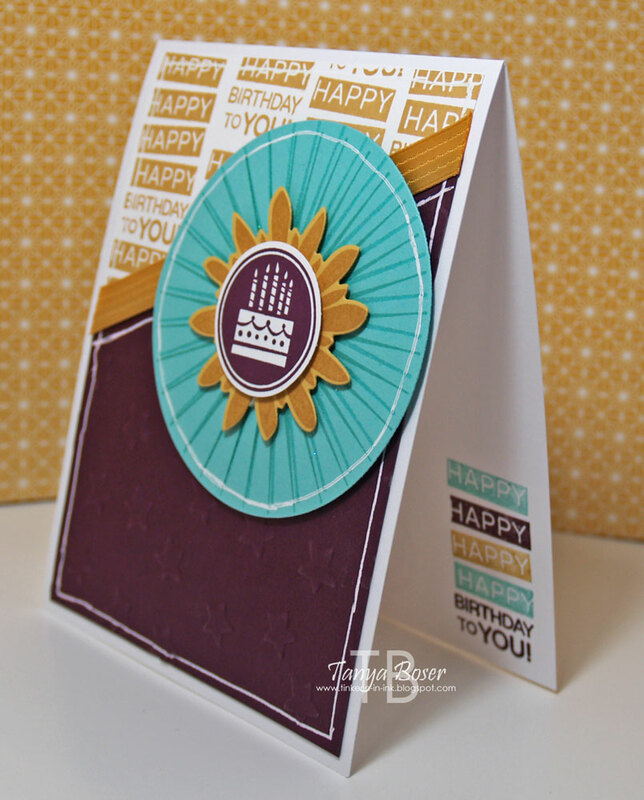 Most will have you sponging the circles in varying intensity with a stencil and sponge or dauber. 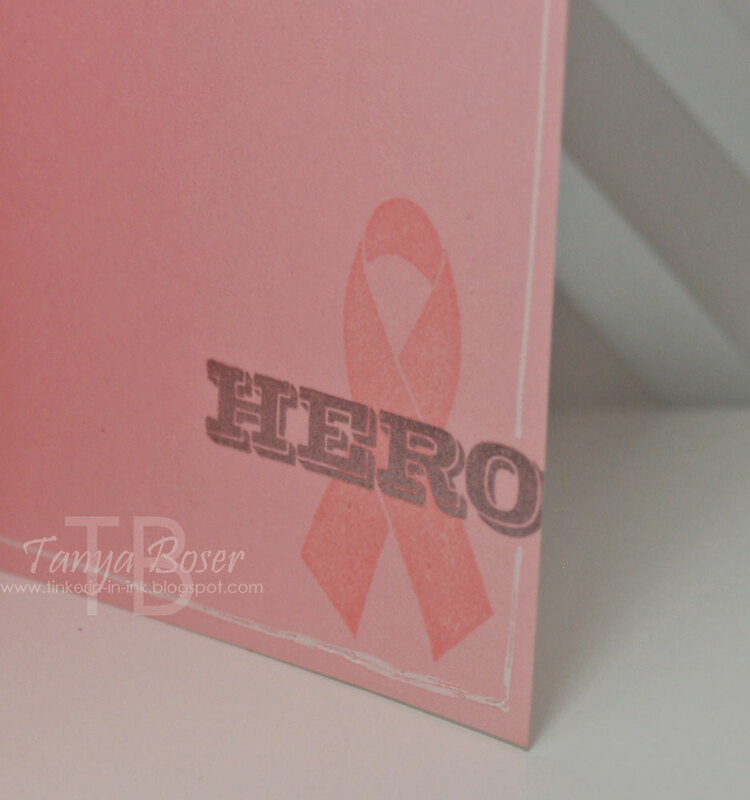 I had a faster method :) I have saved all of those circles of rubber that we pop out of our rubber stamps. I know I got at least two from the Daydream Medallions stamp set and I have a couple more that I can't remember where I got. I have them all in a stamp case labeled "Solid Circles". A peek inside, and a side view to show you the popped up front panel. 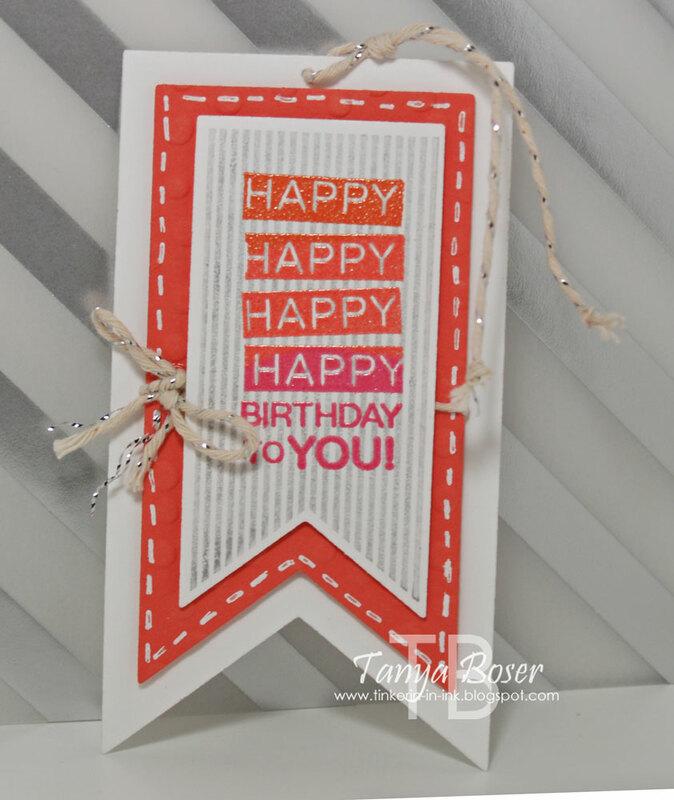 For this card, I sponged Strawberry Slush and Tangelo Twist all over a 3½"x4¾"panel of Whisper White in a random pattern. 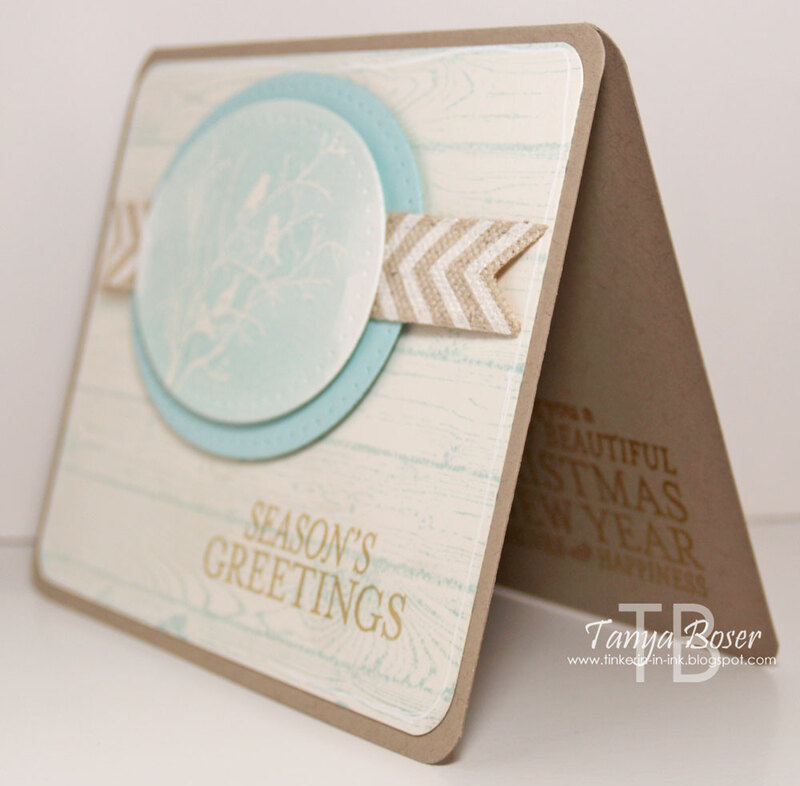 Then I just started stamping a variety of sizes of circles in Whisper White. As you stamp and over lap the circles, the overlapping parts are a more opaque white. 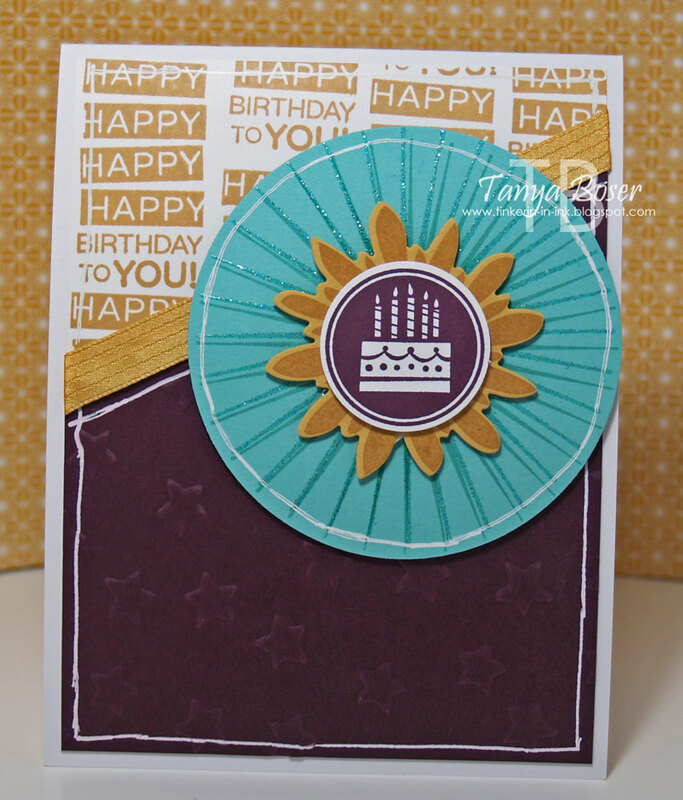 For the last layer of white circles, I used the Cake Circle and the It's For You Circle stamps from Amazing birthday. Heat set the white ink. 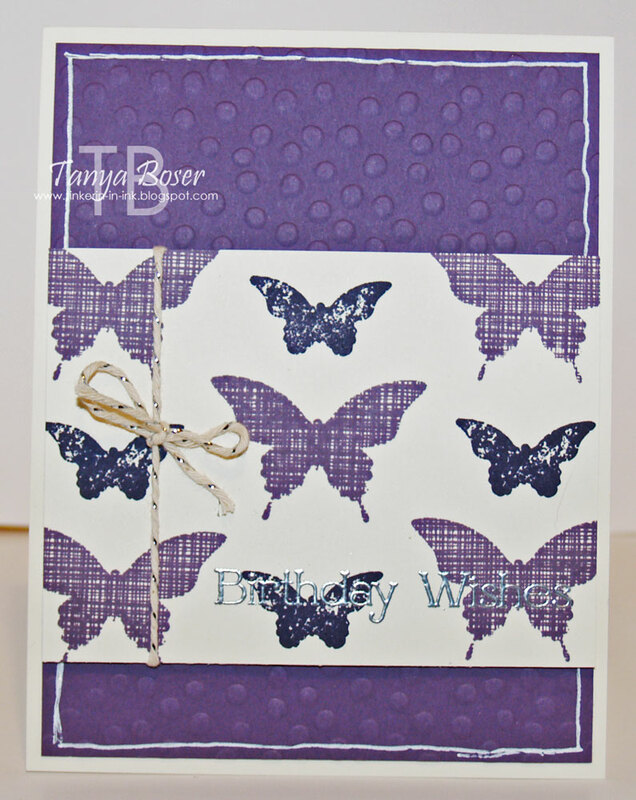 Wipe panel with Embossing Buddy, stamp sentiment with Versamark, and sprinkle with Black embossing powder, then heat with Heat Tool. 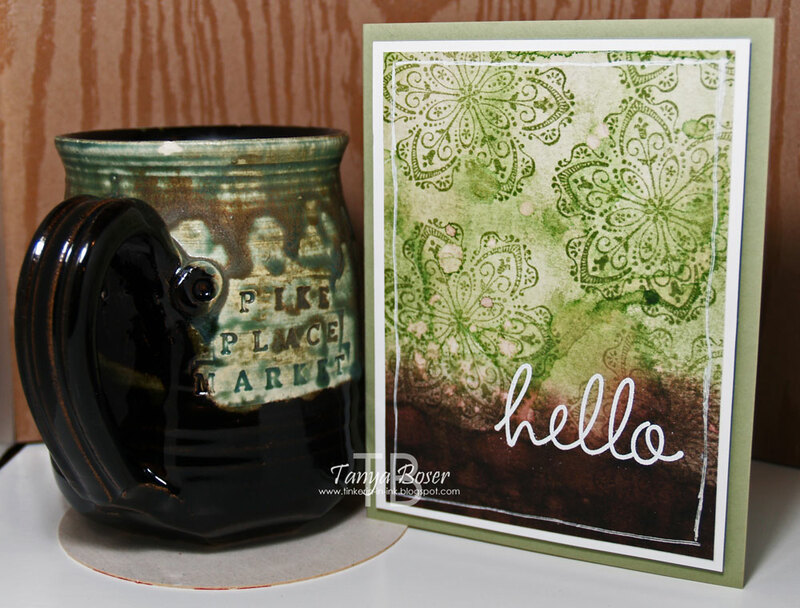 Stitch stamped panel to the scalloped mat. Inside a white card base, stamp the Cake Circle and the It's For You Circle stamps in Strawberry Slush and Tangelo Twist along the right side, stamping off once for each image. 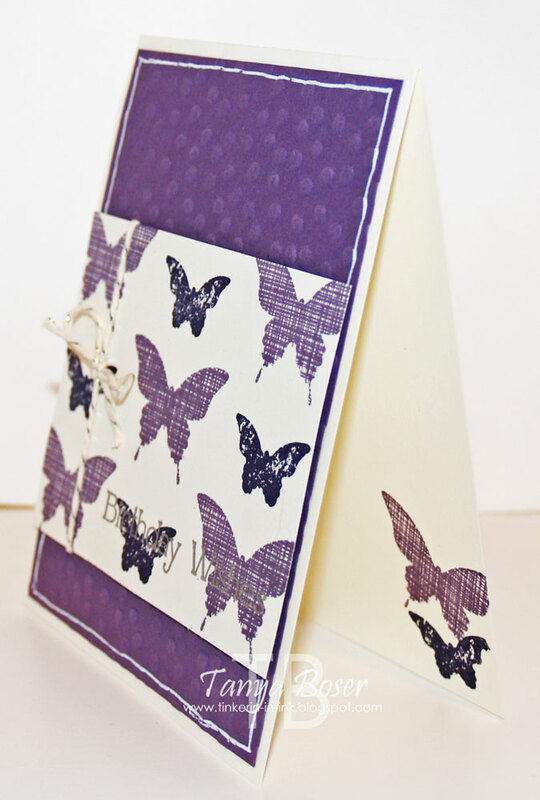 Use LOTS of dimensionals to adhere panel to a white card base. 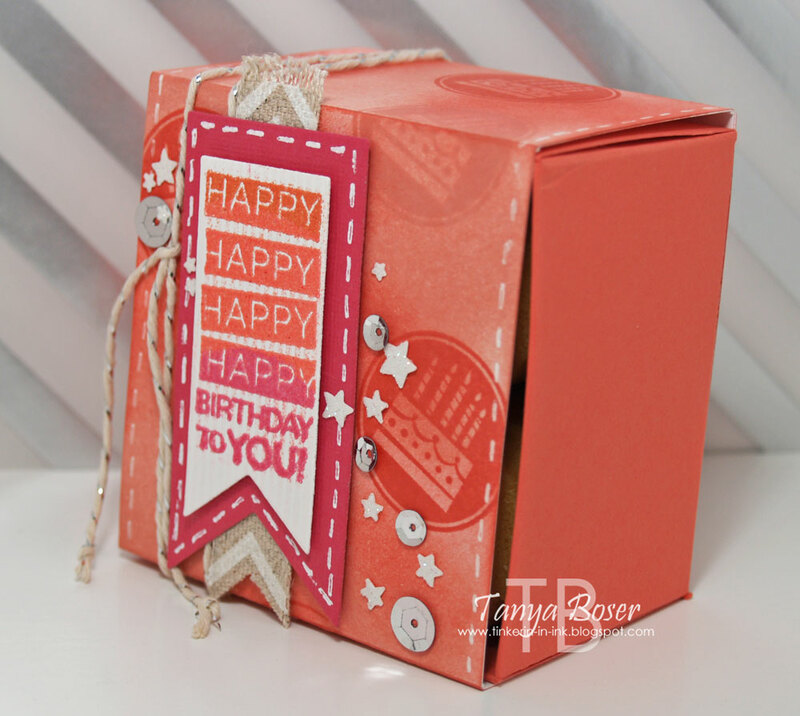 Punch out some stars with Star Confetti punch from Glimmer paper. Adhere stars and Sequins using Crystal Effects. Done! The Happy stamp is very easy to ink with markers by the way, and you can see that I stamped it in the lower right corner inside. Then I decided to make a little box to hold some votive candles. I tried with the Gift Box punch board, but the sizes didn't match the candles well enough, so I went with a pattern I have come up with myself a couple of years ago. I thought I had posted it, but I can't find it now... I guess I will be doing a tutorial soon! 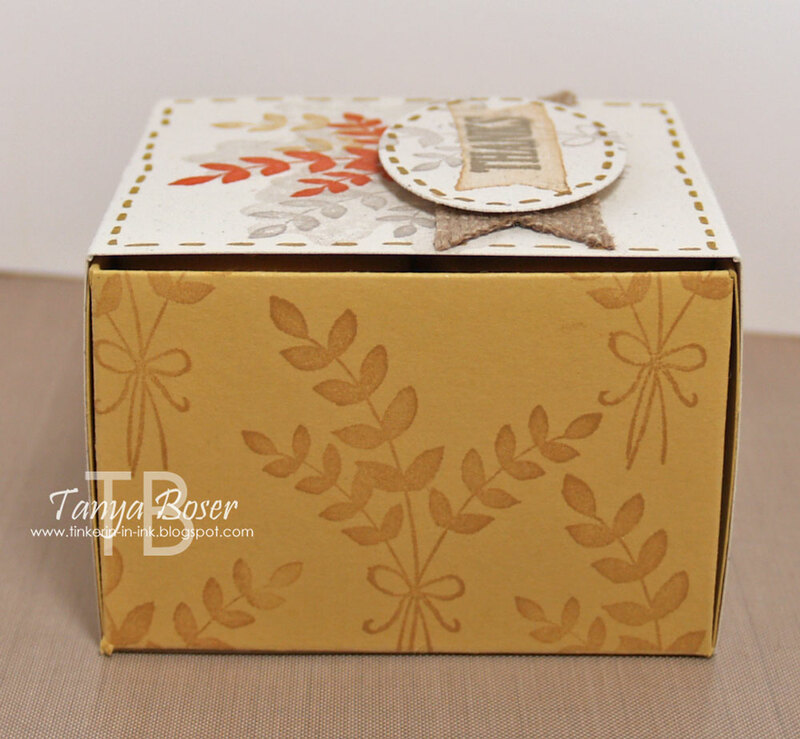 This box holds 4 votive candles, and has a sleeve that slides on and off. The sleeve was sponged and stamped. The tag is embossed with three colors. 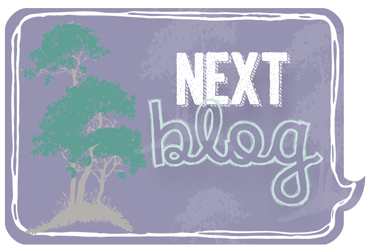 ETA: There is now a video tutorial for this here! Well, that is it, finally, for me. 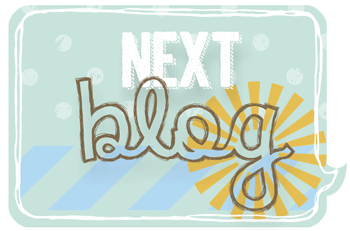 Now it is time to go see what Adriana has whipped up for us! I hope you are enjoying all of the creations we are sharing. We sure enjoy pulling out some of our favorite sets to share with you :) If you have missed any of the past hops, be sure to go to the official Stamp Review Crew site and catch up! 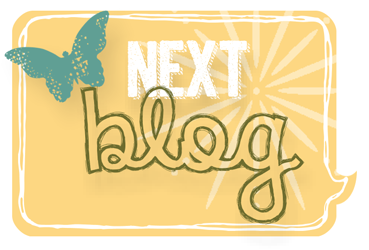 You may have just arrived from Nancy Smith's blog, love her stuff! Or maybe you are jumping around. If you are on this hop and get lost at any time, you can get reoriented here. For my first project, I made an over the hill card. I thought about making it a Halloween card but I don't really send many of those out :) I do have a co-worker who is turning 30 next weekend and she keeps going on about how she is feeling old now, lol! We all keep telling her she is still just a puppy :) She has a great sense of humor and would get a kick out of this card, so she is who is getting this card. I took a 3"x5" piece of watercolor paper and sponged it with Cajun Craze and Basic Gray ink, then sprayed with Vanilla Shimmer Smooch Spritz. Then I die cut it with the large label from Apothecary Accents framelits, then paper pierced and outlined with the white gel pen. 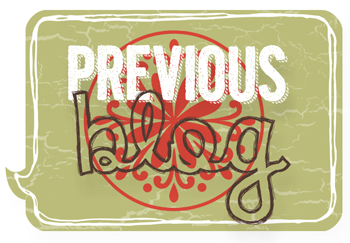 The banner is a 1" wide strip of Cajun Craze that I embossed with Black embossing powder and this great sentiment from the photopolymer set Bombs Away. This one is with the same image, but with a completely different feel. A lovely soft Christmas card. 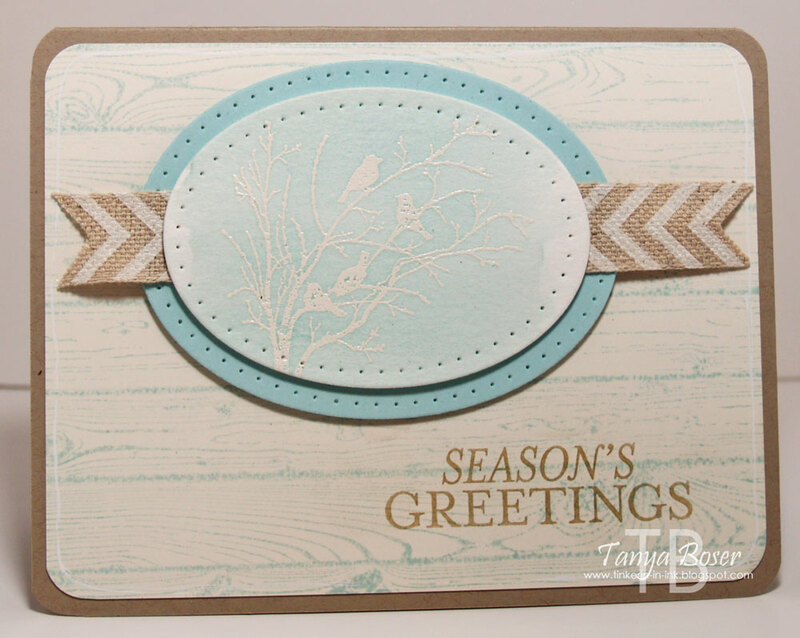 First I embossed the birds and tree branches image in White embossing powder on watercolor paper, then I used an Aquapainter to add the Soft Sky background. Then Ovals framelits were used to cut out the focal point. 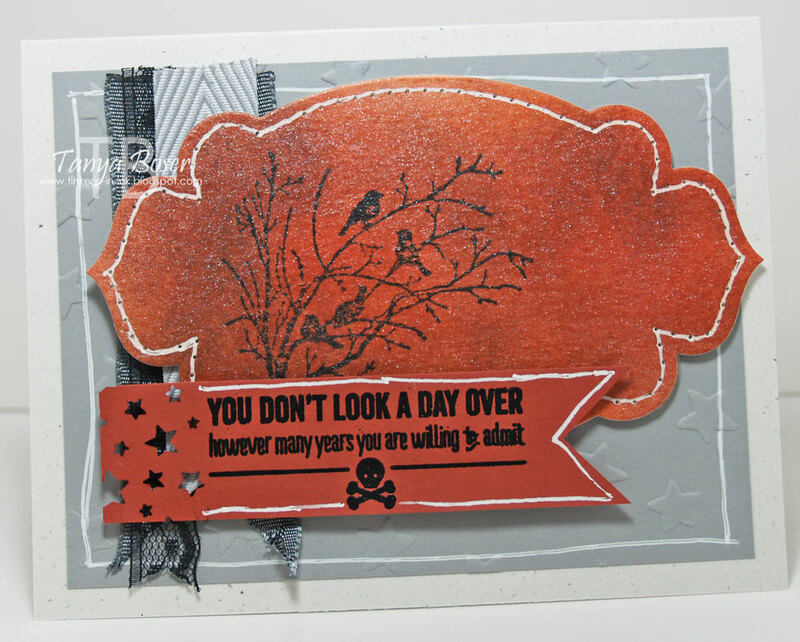 The background panel is a Very Vanilla piece with Hardwood BG stamp stamped off once then on the Very Vanilla panel in Soft Sky ink. 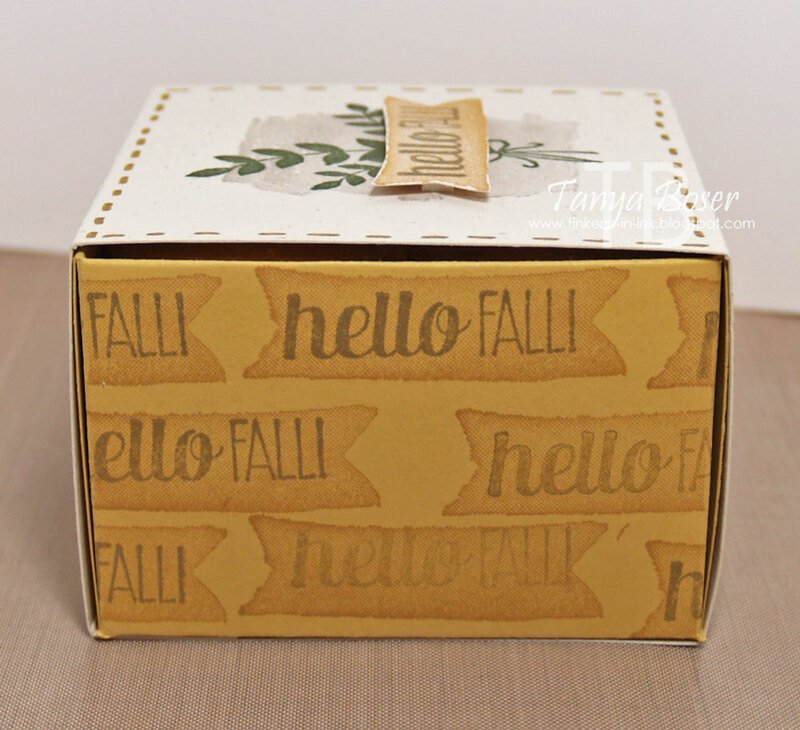 I originally intended to emboss the sentiment with Gold embossing powder, but I apparently didn't swipe well enough with the Embossing Buddy because I had a finger shaped blob right next the sentiment that I couldn't stop getting embossing powder on. SO, I used some Gold Perfect Pearls instead. 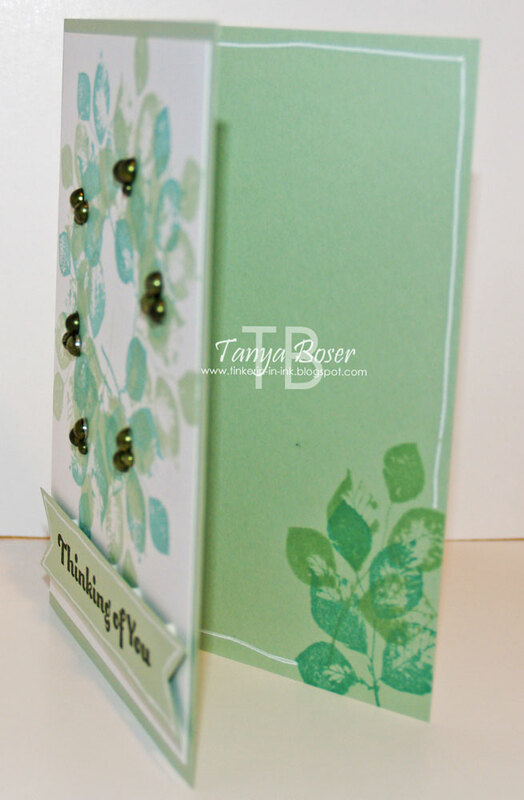 Inside, I used Versamark again with Gold Perfect Pearls on the rest of the sentiment, so it matches the front.